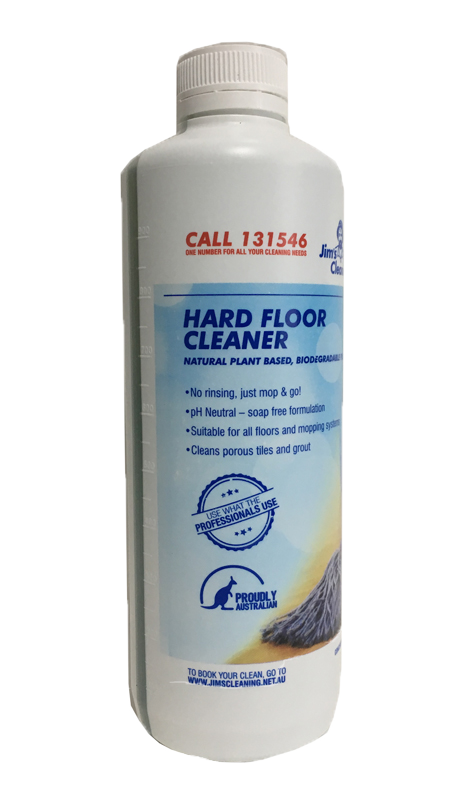 Our No Rinse Floor Cleaner is apart of our environmental and family friendly enzyme-based cleaning products. This product range is plant derived and 100% chemical free. Perfect for residential and commercial cleaning. Available at Godfreys stores Australia wide. Leaves floors cleaner and safer. Destroys odours at the source. Usable in mop buckets, automatic machines and foaming equipment. No deck scrubbing! Mop & Go!! Light Cleaning: Dilute 100ml of Jim’s Floor Cleaner in 10 Litres of water (ratio 1:100). Mop the floor leaving a thin film of water across the surface and allow to dry. Enzyme Cleaner will continue to break down grease and increase slip resistance over a 24 hour period. Heavy Duty Cleaning: Dilute 200ml of Enzyme Cleaner in 10 Litres of water (ratio 1:50). Mop the floor as above and allow to dry. Click here to view Safety Data Sheet. Brendan did a wonderful job cleaning our windows. He was reliable and friendly, have no problem recommending him. Thanks very much. Great service very prompt lovely clean will definitely do again. Cleaner was very informative and friendly.would recommend. Felt safe because we used Jims . Very nice guy, very honest with his customer I'm very happy with Andrew the car detailer. My car turned out amazing it's like it just came out of the factory and he was very professional and took his time to make sure everything was spotless. Thank you so much Andrew! Andrew cleaned our windows & did an excellent job. Always cleaned my own windows but had no time in the last 6 months so called Jim's window cleaning service & couldnt be happier. I have had Ansley perform a full detail on my BMW 320 back in April. I was very happy with his work. I had him come back today to perform a mini detail on my car and full detail on my daughter's BMW 220. Once again, Ansley did a magnificent job on both the cars. I am pleased to see the cars all beautifully cleaned and shiny. I am impressed with Ansley knowledge on quality products used on prestige vehicles. It made be feel confident and alleviated concerns about the cleaning products used. My daughter and I will definitely be calling on Ansley to continue maintaining our vehicles. Excellent Job Sam - thank you. Attention to detail was great. No harsh chemicals. Smells great / neutral. Would use and highly recommend Sam. Thank you, Rita. I work away and nothing beats coming home to a clean house, every 2 weeks for the last 3 years my house is always perfect thanks to Thomas and his team, if your in Perth these guys are the best! Have found Jims Cleaning and Angelo in particular to be the most professional cleaner that I have used as I was nervous allowing a stranger into my home but now he has become one of the family. I can not recommend him highly enough. Peter and his wife at Jim's did a wonderful job on my end of lease cleaning. Polite, on time and job well done! Would use again! Copyright © 2019 JimsCleaning.com.au. All Rights Reserved.